Those of you who have small gardens know how satisfying it is. You grow your own food, you harvest it whenever it is ready, and most importantly, you eat the healthiest food, your own. But, in order to keep your garden safe, you need to take really good care and be very careful. There are many animals and pests that can invade your garden and destroy most of it. Don’t worry. We offer you a short video, that will show you how to make your little greenhouse and veggie box for your balcony or yard. It looks intimidating, but, trust me, it is so easy! 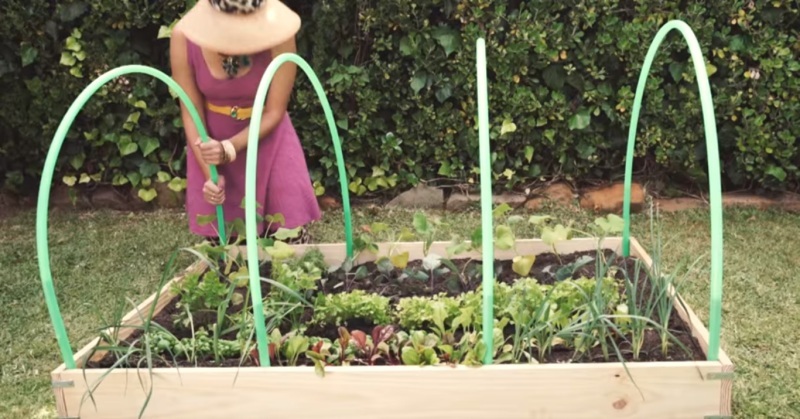 There are a lot of benefits you can enjoy if you have your own small garden. You will keep vegetables at a temperature they need in order to grow, you will keep animals and pests away, and you will conserve water. This greenhouse can trap water in the garden so your plants will have time to absorb it. This video is for you, because I assure you, after watching it, you will definitely want to make your own greenhouse. It would be awesome, if you could share your thoughts or experiences. We will appreciate your engagement.